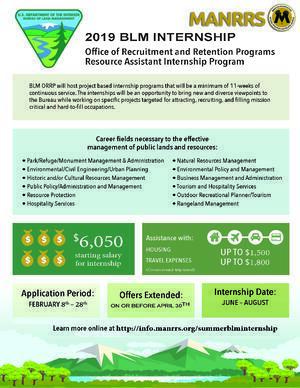 BLM ORRP will host project based internship programs that will be a minimum of 11-weeks of continuous service. The internships will be an opportunity to bring new and diverse viewpoints to the Bureau while working on specific projects targeted for attracting, recruiting, and filling mission critical and hard-to-fill occupations. More than 60 Internships are available for students to apply. Review available positions by location below.